In a world where concern for the environment is high on the agenda, it was only a matter of time before the laptop got a green makeover. Outstripping even theBamboo notebook in eco-friendly credentials, designer Je Sung Park has pushed the concept to its limit and opened our eyes to the laptop of the future: a recyclable paper design. Although they are striving towards more environmentally friendly designs, the rapid pace development in personal computing means that companies are tempting consumers to upgrade by constantly churning out new models. Generally, a laptop is upgraded every two years, resulting in an abundance of disposed computers, or ‘e-waste’. E-waste is a significant problem worldwide - in 2007, only 18% of the estimated 2.25 million tons of TVs, cell phones and computer products disposed of in the US was recycled. The rest ended up as landfill. Je Sung Park's concept design makes the upgrade process both inexpensive and guilt-free. Because the casing is made from pulp and reprocessed materials, it could easily be broken down when disposed of. The design features layers of the paper materials allowing the user the ability to replace any damaged portions. The idea for disposable items is not new, and like disposable cameras and cell phones, the paper laptop would also keep prices down - something consumers are unlikely to argue with. 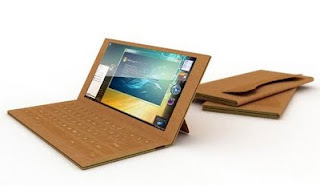 Admittedly, there's a few hurdles to jump before the concept of a completely recyclable laptop becomes a reality, but it's a thought provoking idea.